Maztek aka Matteo Cavo is a EDM, drum and bassneurofunk producer, born and raised in the heart of Italy, Rome, he established in Netherlands in 2014. 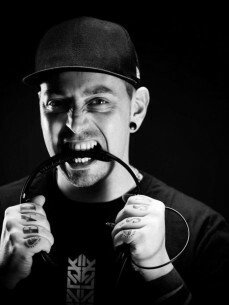 He began his career in 2004, after several releases on various independent record labels he has been featured in 2012 on Renegade Hardware with his Single “Galactica/Odyssey”. In 2005, Maztek formed the label ‘Subculture Records’, that captivated a wide international audience and became a known vinyl and digital label. In 2011, he became one of the Dope D.O.D. producers, a hip hop crew based in the Netherlands, for which produces some beats one of which featuring Redman. For Dope D.O.D. he made another 3 beats out on their new “Da Roach” LP. One of the song features Redman. After that he made other beats for them but also for other UK Hip Hop/Grime bands like Virus Syndicate. “Maztek iz our boy from Italy, He did the Brutality beat on the Evil EP. We met him a couple a times on tour in Italy and it was only right he produced 3 joints on the new album! Be sure 2 check him out! This dude iz crazy with da bangerz. One of the tracks he did features Redman…One of his favorite artists period…This goes for us as well. He’s a true Hip Hop legend.” Dope D.O.D. In 2012 he signs his tune “Twang” on Hospital Records “Sick Music 3″ followed by his tune “Dizzy Step” on Program Records [Ram Records Sub-label and “Hive Mind” on the Drum and Bass Arena Winter Selection 2013. In The same year he has been a part of other Renegade Hardware varius Artists Eps and Remix Eps such as the “Limber Ep” and the “Reanimation Ep”. 2013ends great withareleasefor BTK’s Dutty Audio (What we bring) and his solo EP on Hardware, the “M Theory Ep” whichhas climbedthe charts. 2014 is the Year! As a dj Maztek has already played in the best festivals and gigs in Europe, America and all over the globe but is also preparing for other tours in the UnitedStates and Australia. Release wise he started the year with 2 beats made for Virus Syndicate and out on their Album “Swarm” followed by his “Sinestesia” tune released on Dutty Audio’s “Blend LP” and “Hyper Reality” on Eatbrain’s “Tales of the Undead LP”. Renegade Hardware is also about to release the “Multiverse EP” with Maztek which sees the collaboration between him & Cern as the leading track of the ep. He made also other 2 beats for Dope D.O.D. and Virus Syndicate which will be out really soon..
Maztek’s sound is supported by big names such as Andy C, Ed Rush, Delta Heavy, June Miller, Black Sun Empire, State of Mind, Optiv&BTK to name a few. The release schedule is pretty busy at the moment and the demand for original tracks and remixes is very high, he is working on his first Renegade Hardware LP and he got some Eps and remixes readytolaunch on Labels such as Blackout, Commercial Suicide, C4C Recordings.